When Zimbabweans celebrated after the military toppled Robert Mugabe in late 2017, few could have foreseen that just over a year later their economy would be collapsing and soldiers would be on the streets. It’s a scenario that’s played out all too often when a strongman who has ruled for decades leaves the stage. For almost all of Mugabe’s nearly four decades in charge, his decisions were unquestioned, and his ruling Zimbabwe African National Union-Patriotic Front’s grip on power rarely wavered. By replacing him with Emmerson Mnangagwa, the military won a factional battle within ZANU-PF, weakening it, and sidelined the once-powerful police force and secret service that were key Mugabe allies. 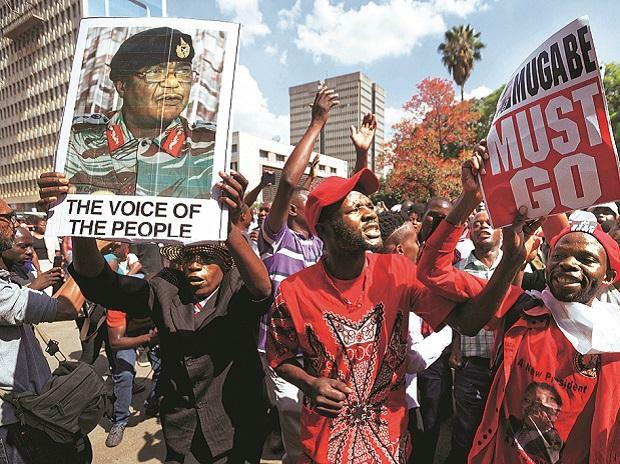 “The glue it had in the past 38 years, that cohesive, forced consensus under Mugabe -- it’s gone,” Tendai Biti, a senior leader of the opposition Movement for Democratic Change, said in an interview in Johannesburg. What’s happening today in Zimbabwe echoes the experiences of other African countries and bears similarities with the chaos currently taking place in Venezuela, six years after the death of Hugo Chavez. In Ivory Coast, Felix Houphouet-Boigny’s 1993 death in office triggered a power struggle over succession and ultimately a civil war that divided the country in two for almost a decade. Somalia hasn’t been a functioning state since Siad Barre was toppled in 1991, and in Congo the overthrow of Mobutu Sese Seko after 32 years in power sparked the world’s most deadly conflict since World War II. In Burkina Faso, the intelligence services fell apart with the ousting of strongman Blaise Compaore, making the country a target of jihadist attacks. To be sure, there are political differences between West and southern Africa. In the south of the continent most countries, including Zimbabwe, are governed by parties formed during the liberation struggle against white rule. In West Africa, power is often concentrated in the hands of one dominant character who maintains control by weakening state institutions, making those nations even more vulnerable to disruption when they’re gone. In addition to the West and central African nations that have fallen apart following the departure of long-term leaders, others may follow. Paul Biya has been in charge of Cameroon for almost 37 years and the country is riven by a separatist insurgency that’s left the ruling elite increasingly divided. Politicians in Gabon are jockeying for power in the absence of President Ali Bongo, who suffered a stroke in October last year and has been recovering in Morocco. In Equatorial Guinea, Teodoro Obiang Nguema has presided over a kleptocracy since 1979. For Zimbabwe the outlook is dire. A currency shortage means it can’t afford essential imports, factories are closing and protests over a more than doubling of fuel prices last month were crushed, with at least 17 people killed. Teachers were intimidated by the military in a subsequent strike and soldiers are a common sight in buses, gas stations and supermarkets. Nick Mangwana, permanent secretary in Zimbabwe’s Information Ministry, declined to comment and Information Minister Monica Mutsvangwa was said to be unavailable. In addition to the tensions between the police and the army, there are open divisions within the ruling party and rumors of strains between Mnangagwa and his deputy and former armed forces commander, Constantino Chiwenga. Mnangagwa retired four generals this week while Chiwenga was hospitalized abroad for an undisclosed ailment, in what has been seen as an attempt to boost his hold over the military. Yet the ruling party is unlikely to be dislodged easily. Mnangagwa is a former spy chief who takes pride in his nickname the “crocodile,” with his office sporting a mug themed on the reptile. “Zimbabwe has a long tradition of political violence, and Emmerson Mnangagwa is a very, very old crocodile who’s always been at the center of that,” Foucher said. That hasn’t eased the chaos. Communications officials often contradict each other, and Mnangagwa has twice condemned violence by his own military.